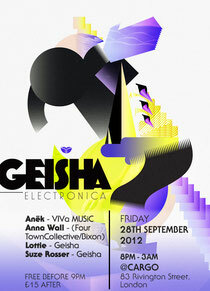 Geisha hits the Cargo arches in London once again next Friday and as always the music will be doing the talking for this all-female driven night. Guest Anek is the first female duo to be welcomed to the exclusive VIVa Music roster. Currently working in the studio on various productions for VIVa and many other labels, their first release will see their track 'Whatever You Say' as part of VIVa Music's 100th EP. Next up is Anna Wall, a name currently building on the underground scene. Anna has shared the booth and gained respect from artists such as Soulcap, Adam Shelton and Jordan Peak, and has also played at Mixmag and Defected parties. Her productions are flowing and tracks have been picked up by UK and Italian labels. The night’s residents include one of the most experienced females in the game and one of the first female DJs to break the scene internationally – Lottie - who hosts Geisha with Suze Rosser. Check out Lottie's set, recorded live from We Love @ Space, Ibiza, below.